At the end of 2015 this blog will be inactive. This blog was utilized to post my experiences, preliminary research and the process of my interdisciplinary practice. The four year content of this blog, from 2011-15, concentrates on forming my Internet-based collection project. The postings pertaining to research or involvement with individuals/ institutions with aspects of the collections do not intend to be disrespectful of the history or present public institution/ museum practices. My print object observation blog posts have usually been about two-dimensional print media style objects. My writing references material culture and my investigations in print media and digital media. 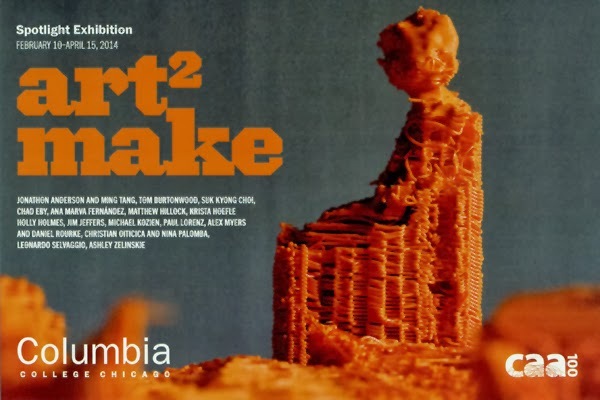 My focus for this writing has shifted from 2D style to an exhibition of contemporary art generated with 3D extrusion printers that I saw during my attendance of the College Art Association (CAA) conference in Chicago, Illinois USA. While observing the 3D printed objects in the Art2 Make exhibit and listening to the first half of the 3D printing roundtable panel discussion that corresponded with the CAA conference, I thought about the relationships of these specific digital methods to the printmaking discipline. A basic print concept I considered is the creation of a matrix to generate some form of multiples. This was presented by the descriptions from the representatives on the 3D panel concerning how the 3D digital modeling software enabled them to generate a “matrix” or digital file to print multiples of a particular sculptural form. These digital files have been internationally distributed and printed at site-specific locations. This process of digital distribution and the Internet has ties to the historical roles of printmaking as a Democratic Voice. This form of public access is acknowledged in the Art2 Make exhibit Internet presence. dialogue of the Art2 Make exhibit by examining the modes of digital media and contemporary art within the two presentation sites (the gallery and the Internet). Meredith Hoy’s exhibit text, Digital Materiality: Expanding Sculpture Through 3D Printing, references the Art2 Make 3D printed objects within the sculptural discipline. Hoy references individual artists artworks, such as Sol LeWitt’s sculptural piece Incomplete Open Cubes and Felix Gonzales-Torres’s Candy Spills to indicate the conceptual sculptural approaches of algorithmic process toward construction and the components of social interaction. While both of these artists have a connection to producing multiples within their work, I identified a broader art theory from some of my current research in presenting my own web-based artwork. Art historian and critic, Lucy Lippard’s theory of the dematerialization of the art object follows suit within the time period of LeWitt and Gonzales-Torres’s artwork. There are approaches from Lippard’s theory that can be applied to the Art2 Make physical exhibit, while emerging contemporary aesthetics of the digital platform within contemporary art are still being formed. The Art2 Make physical exhibit demonstrates Lippard’s conceptual art terms, for example process or systems art, information art, and the de-commodification of art. 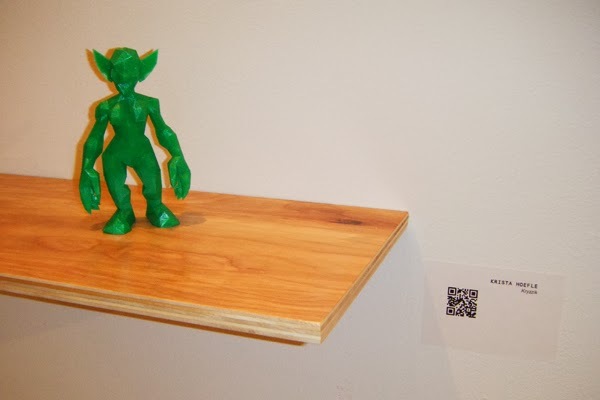 While the gallery space does display the 3D printed objects, the wall space presents information by means of text and QR Codes for the viewer to employ their digital device to have open access to the digital files of each of the artist’s 3D objects. This is seen by the inclusion of my images with this blog post of the exhibit from the Center for Book and Paper Arts. From my perspective, this is where the gray areas of the social exchange generated from the exhibit need to be examined in closer detail with the ideals of the fine art disciplines, the Internet as a platform of presentation, and the social interaction between the viewer and the digital files. I wanted the understanding of how these variables were being documented and if an archive system would keep track of the number of downloadable digital files and the number of objects that were actually printed. In my email correspondence with the Art2 Make curatorial team, I was informed that a conscious effort of tracking the individual downloads was in the beginning stages. In addition, the Art2 Make exhibit has a traveling schedule that offers other opportunities for public access beyond the CAA conference. In viewing the exhibit for the first time, I was intrigued by how the aspects of the digital medium, for example the digital files and 3D printing process, lead to a bridge of interdisciplinary concepts between printmaking and sculpture. My second visit to the exhibit that included the roundtable panel discussion focused my attention to the display and social interaction in the exhibit. Hoy’s essay does extend the idea of social interaction or democratic voice from the digital files to a current non-art world object, Cody Wilson’s 3D printed gun named the Liberator. She does reference the rhetoric of gift-giving, along with the social and political implications of free exchange to the instructions of the 3D printed objects. This type of social implication with the Internet or digital files enables the printed objects to exist beyond the physical gallery space. 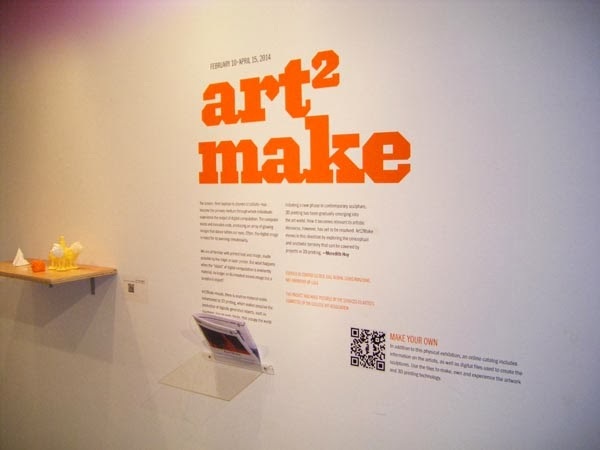 Taking into consideration that the Art2 Make exhibition has an ending date, the artists’ digital instructions are maintained on the website for continual public access. The variables I mentioned earlier now have a role in a postmodern use of the instructions and the 3D printed objects. Miwon Kwon’s essay, Exchange Rate: On Obligation and Reciprocity in Some Art of the 1960’s and After, investigates Lippard’s broad concept of the dematerialization of art. Kwon examines the side were the participants refuse the gift giving or interactive process. She uses Felix Gonzalez-Torre’s retrospective exhibit at the Guggenheim Museum as an example. She describes the museum visitors as happily gathering pieces of candy and collecting sheets of paper, then to her astonishment viewing overfilled garbage cans in the lobby of the museum and just outside of the museum with Gonzalez-Torre’s sheets of paper. Kwon describes from this experience the devaluation of the artist’s gift and the participants’ assertion of their superior positions. 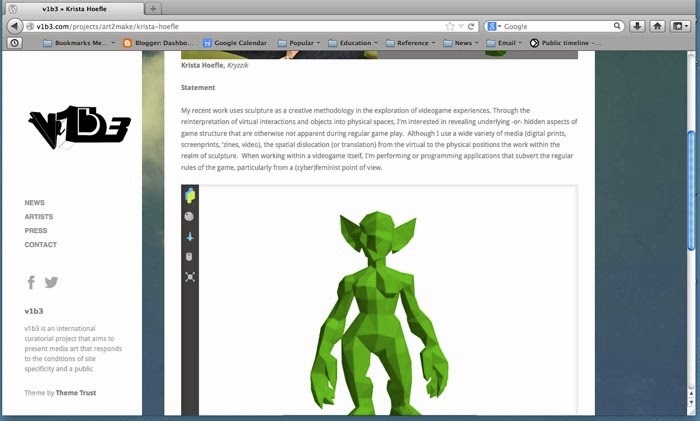 While actual physical objects were being “given away” in Kwon’s example, the future documentation of public access to the digital files and even the count of the 3D printed objects will contribute to the understanding of the role of digital media in the agency of the social interaction arrangement of the Art2 Make exhibit. I am unable to include my social media relationship of the Art2 Make project beyond my viewing with the information on the v1b3 website, because I currently do not have access to the specific software or a 3D printer. My current research on community libraries and their development to offer various digital media sources for public access could change my accessibility to the digital files. Of course, Timing is one main factor to the circumstance with accessibility to 3D printing and forming the media arts historical background. My writing is not intended to be a critique of any portion of the Art2 Make project. I view my observation as a contribution to theory and practice that will continue the conversation in developments of digital media. Thanks to the staff at ColumbiaCollege Chicago, Center for Book and Paper Arts and the v1b3 curatorial team for taking the time to answer my inquiries about Art2 Make. Carrie Ida Edinger’s projects and research with interdisciplinary practice investigate cross-discipline methods and new media. The Internet-based Collection Project has themes that present the social interaction between people and objects. The Internet-based Collection Project Blog is the related preliminary research and activities pertaining to the project. The On The Line Public Raffle Blog was part of the University of California, Riverside and a Riverside California based program of art, performance, and research that looks at clotheslines. The raffle concept was intentionally used to promote engagement with the 2015 California statewide legislation of “Right To Dry.” This blog is concerned with the 2016 participation element, while communicating the research and experiences from the public raffle participants.